I've been looking to buy a Logitech Wireless Presenter R400 since my ex-boss stole mine. The R400 is like the pinnacle of the PowerPoint remote since it does everything so well without any fuss, and it's backed by a well-known brand. I briefly considered again getting the R800 with green laser and vibrating alarm, but the few times I used green laser pointers in my presentations, the overly bright green laser only served to annoy my audience. Anyway, if you've looked at online shops selling the R400, you might've noticed there are tons and tons of cheap "genuine" R400's. I found a shop selling one slightly cheaper than retail, and it showed the packaging with the Logitech logo, and it has hundreds of feedbacks claiming the shop is really good and the product is genuine. All the signs point to it being fake, so I bought one immediately. Comparing to a genuine R400. All images has the genuine on the left and fake on the right. I lost my original R400 when my ex-boss stole it. The one pictured in this post is a new one I just bought from an authorized dealer at list price after the fake one turned out to be, well, fake. Click the images to see close-ups. The genuine one has better plastic and all the silk screening on the buttons as well as the buttons themselves are well-aligned. The genuine one has somewhat shinier plastic on the buttons, but the rest of the body feel similar. As said above, the bodies feel quite similar, so that's a good thing for the fake one if you just want a cheap PowerPoint remote and don't care much for quality. 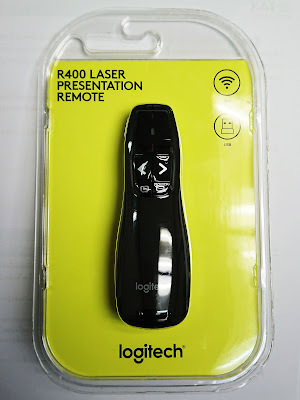 There are many really cheap "R400-style" presenters being sold without the Logitech logo, but this is being sold as a Logitech R400, so I'm calling it a counterfeit. Notice my genuine one has the new Logitech logo that they started using around mid-2015. The laser covering of the genuine one is curved and shaded. The fake one is flat and clearer so you can see the hole behind the covering. The power slider of the fake one is really difficult to slide, and the shape of the switch doesn't quite fit inside the cutout so you can see a bit of green there. On the fake R400, the red sticker that's supposed to be shown when the remote is off is missing. The battery compartment look similar except for the text, but the springs are lower quality on the fake one, and the batteries don't sit so well. Oh, and the fake one doesn't come with batteries. The genuine one has the newer R-R0008 part number while the fake one has the old R-R0004 part number. The fake one is missing a serial number. The battery covers look similar, but the genuine one is shiny inside while the fake is matte. The battery cover of the fake one doesn't fit quite well and will fall inside if pushed too hard. Funnily enough the two battery covers are incompatible with each other. The USB receivers look very similar, but the genuine one is shinier. The fake one appears to have markings that look used, but it came that way. They come with different storage bags. This is just a difference with the year of production. Older R400's also came with the pouch on the right side, while newer ones have the low cost cloth pouch. The fake R400 comes with the old style pouch, but it feels rough compared to the genuine one that my ex-boss stole. And finally, this is what a current genuine Logitech R400 packaging looks like. Even though the Logitech website still shows the old logo, but they're being sold with the new logo and new style packaging. And instead of being called wireless presenters, they're now called laser presentation remotes. I think the scariest thing for a sysadmin is Windows failing to boot, especially after an unnecessary (?) BIOS update. Recently we got two Lenovo ThinkServer TS150's. They're cheap and work really well, and we quickly put one into production since the old server just suddenly up an died. So I was staring at the other server sitting there doing nothing except having a brand new install of Windows Server 2016, and seeing that the BIOS is dated 2016 and the latest is 2018, so I decided to upgrade the BIOS. After the flashing was completed and the system rebooted, I got a black screen and this text: Error code 1962 - No operating system found. Well, the BIOS must've been reset to defaults. Go into BIOS, nope, everything is same as before. Maybe there are new BIOS options... tried some different configurations... didn't work... tried every possible configuration... didn't work... tried resetting to defaults... tried optimized setting... tried swearing... nothing worked. Luckily I have the other TS150, but since it's in production I had to wait until midnight to take it offline to look at the BIOS. Compared all settings and they're all identical except for the BIOS dates. Tried all possible configurations again just in case I missed something. Next, I tried using Linux Live CD's, Windows 10 Live DVD's, and also Window' own rescue mode to flash different versions of the BIOS. Nothing worked. Tried going back to the original BIOS dated from 2016 but it wouldn't let me. Apparently there was a security update in 2017 and they disabled going back to older versions. Next, I used rescue mode and the bootrec command to tried to fix the boot sectors. No go. Gave up. Tried installing Windows from scratch. Nope, Windows complains that it can't be installed to this disk because the hardware may not support booting to this disk. Nooooooooooooooo. Punch reset button in frustration. So while I was tearing my hair out again and pondering what to do next, I suddenly saw the familiar screen. 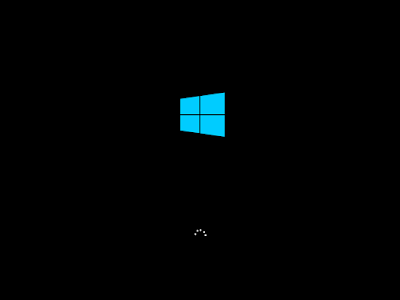 And next thing I know, Windows Server 2016 was booted up like nothing has happened. After much head scratching, I discovered the reason it booted was because it was booting from the Windows install DVD, and because I was tearing my hair out and ignoring the server, the "Press any key to boot from CD or DVD..." prompt timed out, and it automatically booted into Windows. Nothing was changed in the BIOS, the boot sequence was correct, and after testing I confirmed that it will only boot Windows if it was booting from the DVD initially then let the prompt time out. So... apparently after any BIOS update, something somewhere got modified in the boot sector and it would no longer boot correctly. But booting from the DVD then letting it time out seemed like a really strange thing, since this suggested the hard drive's boot sector was still functioning properly, it just wouldn't boot as the first boot device. Tried searching Google for this problem and found thousands and thousands of people with similar problems and no real fix except things I've already tried. Most ended up reinstalling Windows, which didn't work for me. Well, after a week of even more head scratching, I finally came up with a working and reproducible solution (workaround). The ThinkServer came pre-configured with two hard drives which are configured as RAID1 array using the onboard Intel RSTe. I'm guessing the problem could be related to the Intel chipset and the RAID array configuration, but a BIOS update should not mess it up so much. Anyway, the fix was to remove one of the hard drives from the RAID array by booting into the Intel RSTe configuration screen and selecting the option "Reset Disks to Non-RAID". Remove one of the drives then add it back immediately. After that reboot into Windows using the DVD workaround method above. After the array was re-built, Windows could boot normally again. Now let me go test this on my production server.